Lovely apartment in quiet street with 2 terraces. Cathcart Rd is a small east-west residential street between Fulham Rd to the south and Kings Rd to the north. Several tube stops within walking distance – Gloucester Rd and Earls Court both about 6 minutes, Fulham Broadway 10/12 minutes to the west. Many shops, restaurants and cafes on both Fulham and Kings Rd. 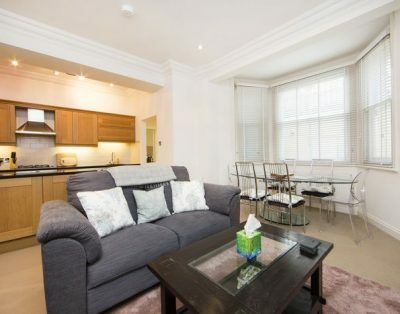 Leafy area yet close to transport to many of the main attractions of central London. 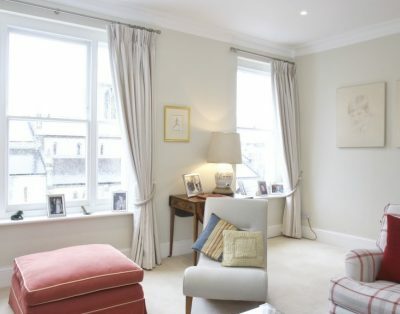 This apartment is on 3 levels ( walk – up) , the first, second and third floors of an elegant period building. Chic modern and stylish decor throughout. Level 1. On the first level is a double bedroom with French doors leading out to a balcony. . One bathroom with walk-in shower at this level. Level 2 .On the second level is the sitting/dining room with comfortable sofas, a dining table and chairs, and open plan kitchen area with all machines. Level 3. On the upper level are the other 2 bedrooms: one with a double bed and full bathroom with bathtub and shower over, the other b with twin beds and a walk-in shower room. This floor leads to the large decked roof terrace, ideal for relaxing after a busy day. NOTE : steep stairs between Ist and 2nd level means the lower bedroom may not be suitable for small children or those with walking difficulties.